On Sunday, Caroline was entering her 3rd bout in four days of competition, and for this fight, she was facing Denitsa Yordanova Eliseeva. Despite her offensive strategy, the Bulgarian boxer ranked 7th in the world wasn’t able to mesure against Caroline’s defence and good movement in the ring. The Montreal boxer was in control of the exchange, which granted her an unanimous victory. Caroline will now square off against Kellie Anne Harrington from Ireland, an opponent she has already met at the 2017 Celtic Cup. After a very physical first bout, Myriam Da Silva faced off agsainst Shakanova Yonusova, a southpaw boxer from Uzbekistan. Despite a little bit of pre-bout jitters, Myriam followed the game plan well and strikes a few powerful blows to her opponent that seem to hurt her. With this convincing 5-0 victory, Myriam cumulates a second win at the World Championships and reaches the quarterfinals against the #1 seeded boxer, Nien-Chin Chen. 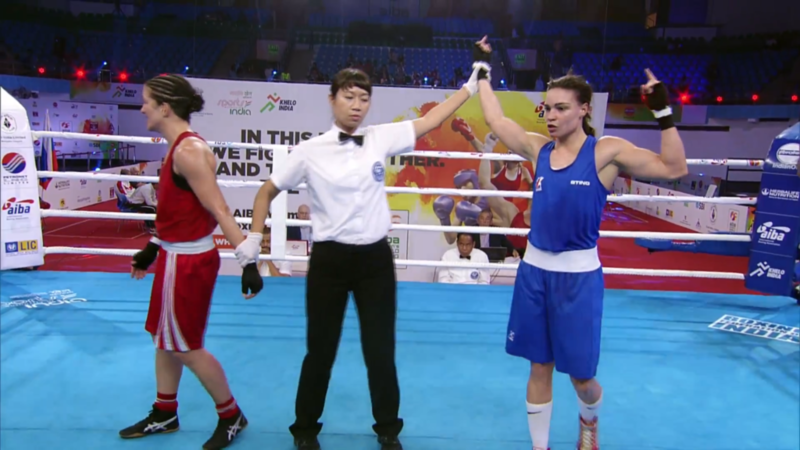 Following her convincing first win against the #4 boxer in the 75 kg category, Tammara Thibeault competed against Chei Kenneally from New Zealand this morning. Being ranked #5 in the world, Tammara quickly imposed her rhythm and won the dual by unanimous decision. For the quarterfinals, Tammara will be facing the Rio 2016 Silver medalist, Nouchka Mireille Fontijn who is currently ranked #1 in the world. For more information regarding the 2018 AIBA Elite Women’s World Championships and to follow our athletes’ progression, visit our Event Web page and social media as information will be updated throughout the competition.